The BBC News website’s recent article promoting Hamas claims concerning a man murdered last week in Tunisia (previously discussed here) included three links to ‘related articles’ presumably intended to enhance audience understanding of the story. 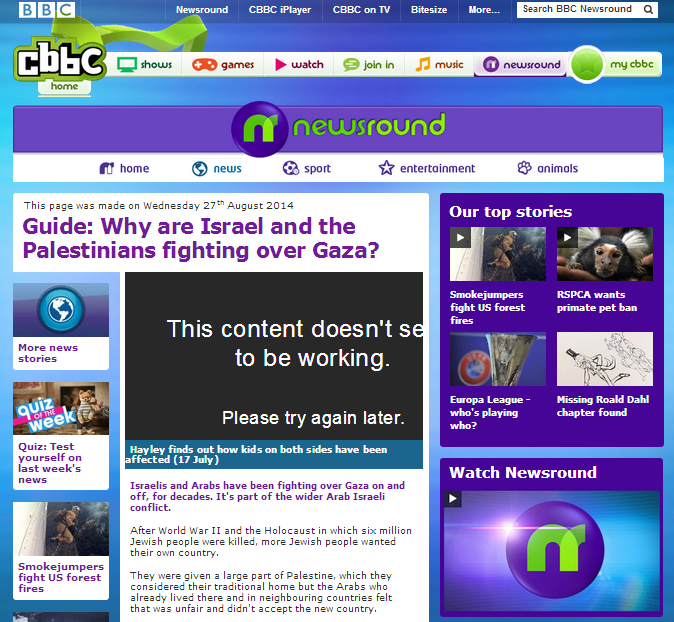 The second of those links – billed “A simple guide to the Gaza conflict” – leads to a backgrounder produced by the CBBC website’s ‘Newsround’ section for children between the ages of six and twelve. Titled “Guide: Why are Israel and the Palestinians fighting over Gaza?“, that rather curious choice of ‘related article’ was originally published in November 2012 and was the subject of a complaint and a ruling by the BBC’s Editorial Complaints Unit in June 2013. “Incidents such as the recent bout of conflict often prompt increased pondering of the topic of why so many educated people in Western countries exhibit a disturbing lack of factual knowledge with regard to Israel. With CBBC apparently reaching 34% of six to twelve year-olds weekly in the UK and its website having a million unique browsers a month, items such as this inaccurate and misleading ‘Newsround’ guide are clearly aiding to perpetuate that situation whilst failing young audience members and their licence fee-paying parents by neglecting the BBC’s obligation to promote “understanding of international issues”. However, as we see, this problematic “guide” continues to be promoted to BBC audiences around the world. 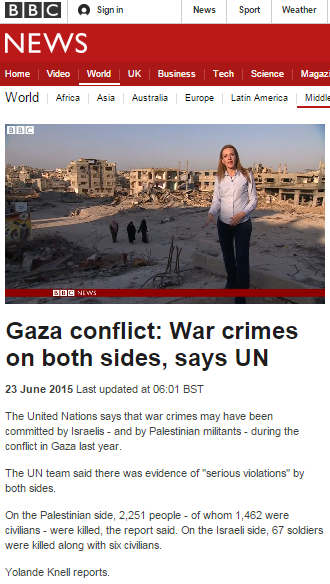 In addition to the written article about the newly released UN HRC report which appeared on the BBC News website on June 22nd, the corporation produced two filmed reports for BBC television news programmes, both of which also appeared on the website. The first report – dated June 22nd and titled “Gaza conflict: ‘War crimes by both sides’ says United Nations” – is by Lyse Doucet and – like the UN commission which revealingly titled its report as being about the “Gaza conflict” of 2014 – Doucet’s opening lines negate the fact that hostilities took place in Israel too. As was the case in the BBC’s written report, Doucet makes no effort whatsoever to inform audiences of the inquiry’s ignominious beginnings or of the ensuing report’s many problematic aspects – not least its reliance on ‘evidence’ from anti-Israel activists and political NGOs engaged in lawfare against Israel. And so, with no critical analysis of the report’s value and validity offered to audiences, Doucet goes on to promote some cherry-picked quotes against a background graphic again featuring a literally one-sided picture. Doucet makes no effort to clarify to audiences that one of the report’s many shortcomings is its failure to acknowledge the fact that “Palestinian authorities” in the Gaza Strip are the exact same people carrying out the war crimes, targeting Israeli civilians and performing extra-judicial killings of political opponents. Doucet makes no effort to inform viewers that Egypt too refused the commissioners entry to the Gaza Strip via its territory. The impression audiences are intended to take away from this report is amply clear in Doucet’s closing remarks which dedicate ten words to a very sterile presentation of the Israeli side of the story and almost four times as many words to description of the Gazan side. Likewise, the links offered to visitors viewing this report on the BBC News website display a similar lack of impartiality. Audiences are offered the BBC’s uncritical and unchallenging written report on the same story, a BBC News report from May 2015 which amplified anonymous claims promoted by the inadequately presented political NGO ‘Breaking the Silence’ (a major contributor to the UN’s report), and another BBC News report from May 2015 which amplified a report by Amnesty International (also a significant contributor to the UN report) whilst ‘contextualising’ Hamas torture and execution. Most notably, audiences are also provided with a link to a seriously flawed ‘guide’ produced by CBBC (the BBC’s children’s department) which has still not been corrected since its publication last August. 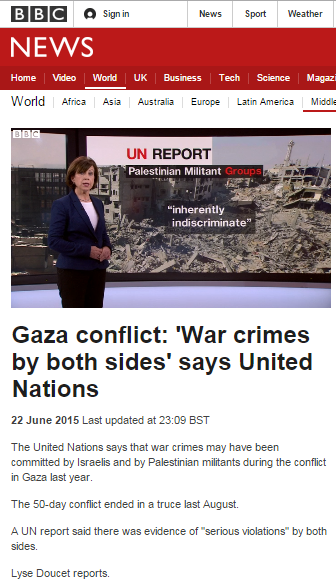 The following day – June 23rd – viewers of BBC television news programmes saw another filmed report – this time by Yolande Knell and titled “Gaza conflict: War crimes on both sides, says UN” – which again included no critical analysis of the UN report whatsoever. Viewers found Knell using the standard ‘Israel says’ formula in her opening sentences – employed regularly by the BBC to communicate to audiences that it does not endorse the statements which follow. “Today in Gaza the Hamas authorities said the report created a false equality between victims and their killers. She goes on, failing to inform audiences of the political back story to the UN’s casualty figures which the BBC has been religiously quoting and promoting for almost a year. As was the case in the previous day’s written article and in Doucet’s filmed report, she fails to mention that Egypt also did not grant the commission entry – even though that fact is noted in the UN report. Indeed they did, but Knell does not attempt to make any critical examination of whether or not that criticism was relevant or justified – hardly surprising perhaps when one considers that the BBC only recently elected to pass up the opportunity to correct the misleading impressions it too propagated regarding that same incident. The BBC’s three reports on this topic have all been superficial, uncritical and unchallenging. Audiences have had no choice but to take the slivers of the report’s content selected by BBC journalists for amplification at face value and no attempt has been made to objectively inform them of the political background to the commission and its report. Likewise, no effort has been made to put the process and content of this report into its wider context of the effect it may have upon all Western armies fighting terrorists anywhere in the world. 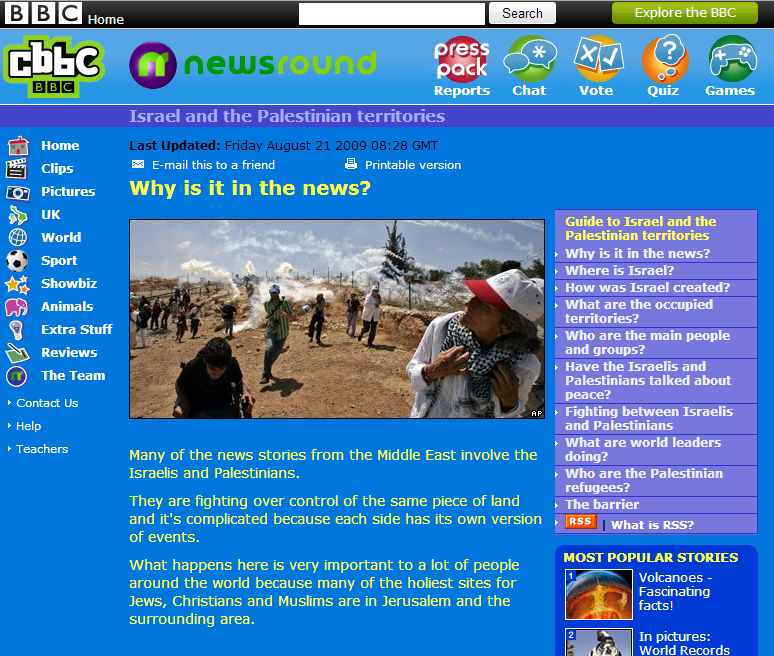 The CBBC (Children’s BBC) news programme ‘Newsround’ is aimed at six to twelve year-olds and, in addition to its television broadcasts, it also has a website. On that website, young children can view an item from 2009 titled “Guide to Israel and the Palestinian territories” which in its ten different pages includes numerous accuracy and impartiality related issues – not least a distinctly inaccurate portrayal of the British mandate era which erases the Balfour Declaration, San Remo and the League of Nations from history as well as turning Jewish refugees from Arab lands into a group of people who simply moved house. “Before World War I, Palestine was a district ruled by the Turkish Ottoman Empire. The Ottomans were defeated by Britain and her allies in the war. After WWI, Britain took control of Palestine, but there was much trouble between the Arabs who lived there and Jews who wanted to live there too. Jews have long historical and religious ties to the land dating back thousands of years. They believe it was promised to them by God. In the early part of the 20th century thousands of Jews moved to the area before it became Israel to start new lives and set up new communities. Many were escaping Europe and Russia as they were where they were being persecuted for being Jewish. Many more moved to Israel after the Holocaust, including from Arab countries. “After the 1948 war, Jordan took control of the West Bank and Egypt took control of the Gaza Strip. The city of Jerusalem was split, with Jordan taking control of East Jerusalem while West Jerusalem was in Israel. Israel captured the West Bank, Gaza Strip and East Jerusalem during another war in 1967. Since then, Israel has set up many Jewish settlements – communities, some tiny, some as big as small towns – in both the West Bank and the Gaza Strip. These settlements are considered illegal under international law, although Israel does not agree with this. Palestinians in the West Bank, including East Jerusalem, have lived under Israeli occupation since 1967. Human rights groups have recorded widespread abuses by Israeli soldiers of Palestinians. For example, the Israeli army has put up lots of check points and roadblocks between villages and towns. Palestinians say it makes it much harder to visit friends and family or get to work, school or hospital. Some Palestinians compare the restrictions on their lives to being in a prison. The Israeli government says the checkpoints are to protect settlers and to prevent potential Palestinian suicide bombers from harming Israelis. Life for the many of the 1.5 million Palestinians who live in the Gaza Strip is difficult. It is a narrow piece of land along the Mediterranean coast and access to it is very limited. It is fenced in and Israel controls its coastline and all the entry and exit crossings into Israel. There is another crossing point into Egypt. There is no working airport. Because access is so restricted, not many goods get into or out of Gaza. Food is allowed in, but aid agencies say families are not eating as much meat or fresh vegetables and fruit as they used to. There are often power cuts. Large numbers of people have lost their jobs because businesses can get very few of their products out of Gaza to sell, and people don’t have much money to buy things. No connection is made between restricted access to the Gaza Strip and the terrorism which made those restrictions necessary. On the page titled “Fighting between Israelis and Palestinians” the terrorism of Fatah and other organisations comprising the PLO during the second Intifada is also erased and terrorism is attributed to ‘frustration’. “In the 1960s, many Palestinians grew frustrated at not having their own state. They formed armed groups that attacked Israelis and Jewish people. The leaders of some groups, like the Palestinian Liberation Organisation and Fatah, have said they won’t hurt Israelis anymore. Other groups, like Hamas, are still violent. They have fired rockets towards Israeli towns and sent Palestinian suicide bombers to kill Israelis. More than 4.6 million Palestinians are refugees, many living in camps in the West Bank, Gaza Strip, Syria, Jordan and Lebanon. They get help from the United Nations. On the page headed “The barrier” a version of the standard impartiality-challenged BBC presentation of the anti-terrorist fence appears. “Israel is building a massive barrier in the West Bank. It is mostly a fence, but some of it is a concrete wall. The Israeli government says the barrier helps prevent Palestinian suicide bombers travelling to Israeli cities to kill Israelis. It says it is only temporary and can be removed once a peace agreement is reached. Palestinians say it is creating a new border and cutting into land they hope will form a future state of Palestine. They also say the barrier cuts through Palestinian villages and land, stopping farmers from getting to their land. No attempt is made to explain to the children reading this guide what the whitewashed term “armed resistance” really means. It is not clarified that the “right” claimed by Hamas and amplified by CBBC actually translates into the firing of military-grade missiles at children of their own age on their way to school and the bombing of school buses. The young readers of this ‘guide’ are not provided with any explanation as to why the indiscriminate murder of civilians is not actually a “right” which can be legitimately claimed by any person or group. The majority of licence fee-paying parents probably do not categorise CBBC as one of the internet sites they need to monitor for content inappropriate for their six year-olds. But the fact that for nearly five years that trusted national treasure has been amplifying the notion that “armed resistance” – in other words, terrorism against civilians – is a “right” on a website aimed at child audiences should clearly prompt second thoughts about that view. So what brought about such a speedy change in the wording of this article? The answer to that question can be found of the website of CAABU – the Council for the Advancement of Arab-British Understanding – which, on November 22nd, announced that it had made a formal complaint regarding the ‘Newsround’ item of the previous day. On December 6th, the CAABU website announced that changes had been made to the item and provided a link to the BBC’s response of December 3rd to CAABU’s complaint. Many BBC Watch readers will no doubt be amazed by the unusual alacrity of the BBC’s response to this complaint, but additional factors may go some way towards explaining it. “Caabu has a distinguished history of working to change the pro-Israeli atmosphere in British politics in the 1960s and 1970s. Much has changed since then, and the plight of the Palestinians is now widely recognised. “Today, 70 per cent of the British public support Palestinian rights, which is a huge shift from 1967, when 20 years after the end of the Second World War there was still a lot of sympathy for Israel,” Doyle said. Caabu’s core mission has been the crucial work of lobbying on key issues concerning British-Arab relations, such as Palestinian rights, making sure that the British government is constructive in its relations with other states based on international law and human rights, helping those countries that are en route to become democracies, and working with both media and schools. “We talk to between 10,000 to 15,000 school children every year. We are the only organisation in Britain that gives children an opportunity to engage with the Arab World. Dr Amiee Shalan is the head of education, and she manages associate speakers who Caabu trains to speak to 16 to 17 year olds. We try to get them to look behind the headlines. We aim to get them thinking, and provoke them to have a different attitude on how they look to the region,” Doyle said. A core function of Caabu is to lobby parliament. “At a time when so much is going on the Arab world, British politicians need an organisation which can synthesise everything into an easily understood coherent narrative, so that we can explain the main trends of what is happening in the region. Caabu regularly takes delegations to the Arab world. It took 19 members of parliament to Palestine last year, and the members saw for themselves what it is like. They themselves felt the impact of the colonies, and the blockade of Gaza among other irritants. In other words, CAABU is an integral and well-established part of the Arab lobby in the United Kingdom with no fewer than three MPs and two former MPs sitting on its executive committee. Some of those board members, however, can be rather coy about the organization they support and represent. The British Syrian Society was founded in 2003 by Fawas Akhras – the father in law of Bashar al Assad. His daughter – Asma al Assad – is reportedly a patron of the BSS, which also included among its ranks the Assad regime supporter Wafik Said. Until July 26th 2010, Rim Turkmani – wife of CAABU’s Director Chris Doyle – was a director of the British Syrian Society. Another director of the British Syrian Society (since March 23rd 2010 and to this day) is Shaza Shannan, who was also vice-chair of CAABU from February 2009 until April 5th 2012. According to the BSS website, Ms Shannan also works as a management consultant for the FCO-funded British Council and was also described as holding a position with that organization when, in 2010, she appeared together with Chris Doyle at an event at the London International Documentary Festival. In 2007 Shannan organized a conference on the subject of the Golan Heights in London with the collaboration of the Syrian Media Centre in London (formerly headed by Ghayth Armanazi – also executive director of the British Syrian Society) and the Syrian Embassy. Among those attending was Fawaz Akhras and among the speakers was Jihad Makdissi – Syrian Embassy and Foreign Ministry spokesman from 1998 and until his reported defection at the beginning of December 2012. Here is CAABU in 2008 advertising via Google Groups – on behalf of the British Syrian Society – a lecture by Brigid Keenan (more on her here). In other words, CAABU co-chair Andy Love was not being frank when he claimed “zero links” to the BSS and – by extension – the Syrian regime. But what does all that have to do with the above mentioned complaint about the CBBC children’s programme ‘Newsround’? Well, another board member at CAABU is named Jonathan Fryer – an aspiring Lib Dem MEP, a lecturer at SOAS , a recent participant in the Arab League Conference on Palestine in Baghdad (together with his “chum” Craig Murray) and a past participant in the Doha Conference on Jerusalem. A seasoned anti-Israel campaigner , he is also apparently the man Deborah Fink copies in to her e-mails of complaint about the sacking of Jenny Tonge. In addition, Jonathan Fryer happens to be a journalist (apparently freelance) for the BBC’s ‘From Our Own Correspondent‘ programme. Whilst Fryer’s dual role as CAABU board member and BBC journalist does not of course guarantee instant compliance with CAABU complaints, it certainly does not seem to be doing any harm. What is odd is that the fact that a board member of an organisation which frequently lobbies the BBC also does work for it – and that this does not appear to be perceived as a potentially problematic conflict of interests by the BBC itself.